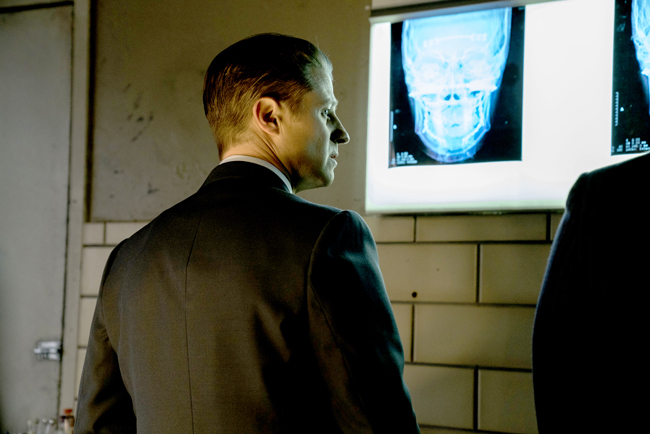 There was a lot of action in this week's episode of Gotham and none of it featured Bruce Wayne. Yay! (Unfortunately, we'll have to deal with him again in the upcoming midseason finale.) This week was really about Sofia Falcone. Is she trying to help Jim Gordon or Penguin? The identity of the Pyg is sought, and a surprising turn of events puts Sofia in the possession of the Sirens. And while all that is going on. Lee and Edward are dealing with territorial disputes in the Narrows now that Lee is in charge. We'll cover that first since it was a rather small part of the episode. It seems that with Cherry no longer running things, another crime lord of the Narrows is threatening to take over everything including Lee's clinic. But he refuses to bargain with her, and even after she tried to convince him he has a deadly virus that only she can cure, he goes so far as to trash her clinic to send her a message. But she finds one bottle of medicine undamaged and uses it as her bargaining chip. Returning to make a deal, she's managed to slip poison into his drink and tells him to leave the Narrows or else he dies. Sampson agrees and she gives him the antidote. This wasn't really an important part of the story for Lee, but it was important for Ed who is still fuming that Lee hasn't done anything to fix him. But Lee tells him there's nothing wrong with his mind. Ed was always one step ahead of Sampson and guided her through every step to get him out of the Narrows. She hasn't said anything to him because this is the Ed she used to be friends with, and she likes being friends with him again. Later, realizing that he's just had a mental block, Ed sees The Riddler taunting him in the mirror. But does Ed want to be that person again? It looks like he has no choice. In another small part of the main story, Professor Pyg is incarcerated at Arkham and it's discovered that he's had massive facial reconstruction surgery to disguise his true identity. Gordon is confused by this because the Pyg is all about being in the spotlight. Jim enlists Lucius to do some facial reconstruction work using Pyg's x-rays and they discover he's really a Southern serial killer named Lazlo Valentine, who had escaped prison. Heading back to Arkham, Gordon finds a dead guard, a missing prisoner and a message painted on the wall in blood signed "Lazlo". The main plot this week is the delicate dance between Penguin and Sofia, and a little bit of betrayal on the part of Penguin's "conspirator" Martin. Oswald is still angry about Martin's report that he saw Sofia kissing Gordon. But Matin confesses Sofia told him to tell Penguin that lie which leads to his banishment from Penguin's home and call in The Dentist to torture information out of Sofia. But Sofia was one step ahead, already having enough information on The Dentist and his family to convince him that any harm done to her would result in more harm to his family so he helps her escape. 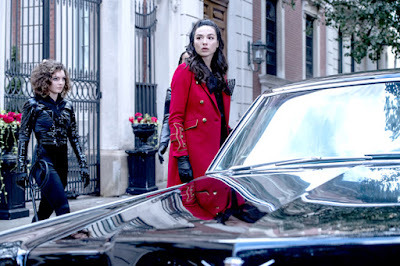 But there is a little wrinkle in Sofia's plan when the Sirens show up and kidnap her thinking she's still on Penguin's side. They make a deal with Penguin for full autonomy in Gotham and he agrees ... and then send Victor Szaza to blow them all up. Now Sofia has the power again and the Sirens side with her after their narrow escape. Sofia then goes running to Jim with a sob story about how Penguin tried to kill her, but he pretty much tosses her out on her ear -- sending her back to the Sirens -- and makes a deal with Penguin after he realizes Sofia was trying to play the two off of each other and start a war which would leave her in power. Jim tells Penguin he'll get Sofia out of Gotham on the condition that Penguin ends his crime licensing program. He reluctantly agrees because he doesn't need a war with the GCPD. Gordon puts Sofia on a train back to Florida but Penguin discovers that Martin has been kidnapped so he sends Victor to extract Sofia from the train. 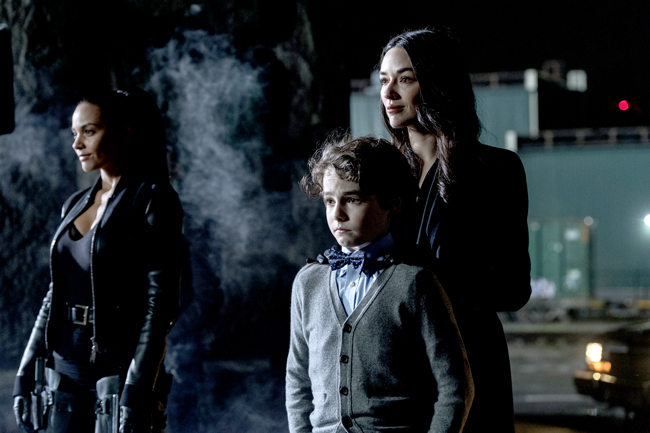 Sofia tells Victor to tell Penguin to meet her and the Sirens under a bridge and she'd turn Martin over in exchange for the entire Gotham crime underworld. At the meeting place, an enraged Penguin agrees to her terms and puts Martin in his car ... and then BLOWS IT UP! 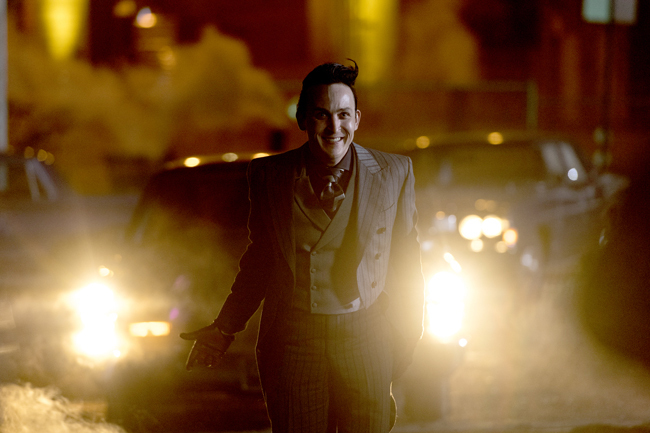 Out of all the jaw-dropping Gotham moments, this one is top of the list. Just as shocked as the viewers, the women find themselves under fire from Penguin's men and have to beat a hasty retreat. While Gordon and Penguin avoided their own war, Penguin is definitely now at war with the Falcones and the Sirens. The twist of all is is that Martin is not dead. It was all a ruse, with the car parked over a manhole so the boy could escape before the explosion. But Penguin knows that keeping the boy around will only put him in more danger if anyone learns that he's still alive so Penguin reluctantly sends the boy away so he can't be used as a bargaining chip ever again. It was a truly heartbreaking moment to see Oswald lose yet someone else in his life that he loved, even though he'd never admit the boy was anything else more than a "conspirator." Coming up next is the fall finale and the return of Carmine Falcone and ... Jerome Valeska! And then an interminable wait for new episodes in the spring. Gotham airs Thursdays at 8:00 PM on FOX. What did you think of this episode? Let us know what you think in the comments section below.